Beaverlodge Arts and Cultural Centre is a beautiful place to have a show! Our opening Sunday was very enjoyable. Our six members and a couple of spouses turned up to help carry, unpack, arrange and hang the show on a nifty new hanging system consisting of movable wires and clips. Right on time we left for our lunch meeting and came back to the warmth of the Beaverlodge Arts community. The Pink Tea Room beckoned, along with a buffet of tasty snacks and confections, but a crowd of visitors was gathered for our official opening. 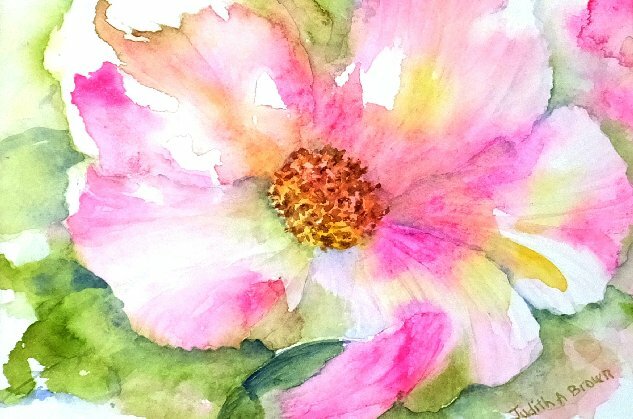 Congratulations to the members of Peace Watercolour Society: Mimi Zhang-Mackie, Toni Schuler, Angela Fehr, Marjorie Henn, Judith A. Brown and Carolyn Kosabeck. It’s another beautiful show! Carolyn’s card for the PWS Christmas card swap on the weekend is the culmination of all those images painted before Christmas. Though not quite the large scale painting I once had in mind, this is still a good effort considering how I exhausted the subject! Oddly, one of the topics of conversation at the party was how some artists recommend painting a subject two, ten, 120 times! Well, I quit (for now) at whatever number this is, pleased with the way it turned out. Judy was pleased too: she drew my card. The Peace Watercolour Society has been enjoying a Christmas get-together for decades. It involves a yummy potluck supper, a good discussion of all things watercolour, and a card exchange. That way, not only are we inspired to paint a card, we get an original watercolour from one of our peers! This year Judy’s card was inspired by a local scene, the Spirit River itself. The deep blues of the shadowy riverbed look peaceful and mysterious. Whose tracks are those? What goes on down there where nobody goes? Our Peace Watercolour Society Christmas party was purposefully late. Christmas is just too busy for one more party! Last Saturday we hosted the get-together/annual meeting. There was a great variety of potluck food to try, and then we indulged in our traditional Christmas card exchange. Each artist painted an original watercolour, put it in an envelope, and then we all drew a surprise painting to take home. This is the painting Judy did: it didn’t have to have a Christmas theme so she painted a bright floral portrait.